If you need a momentary respite from Christmas craziness, just go west. It's a long drive to Ko Olina, but Azul's Sunday champagne brunch is worth the effort and the extra few cents of gas. Cost: $45; $20 children. An 18 percent service charge is added for parties of eight or more. The cost is somewhat prohibitive so early in the morning, at $45 per adult, but that is part of what helps keep the ambience so peaceful and relaxing, void of crying infants and toddlers running around table legs and the property's man-made ponds. Besides, the price includes champagne, mimosas, teas, sodas, juice, smoothies and house wines. At the restaurant, you're immediately whisked on a guided tour of the extravagant buffet. I would have been happy with all I saw in front of me, but there was more in the form of a small plate station, and as if this weren't enough, diners also get to choose one dish from a menu of full-size entrees, while hoping to save some room for the sweets waiting at the dessert station. I've rarely had food this good since returning from trips to New York and Seattle earlier this year. But I do have to add a qualifier in that this is a foodie's paradise and perhaps not the place for those just looking for a generic buffet with a variety of hot entrees or an omelet bar. In fact, there are few eggs to speak of, no bacon and no Spam. What you'll find are nine stations, including a Bloody Mary bar, featuring high-quality, if low-labor Mediterranean-style fare. One could, conceivably, amass all the building blocks for a similar meal at fish and farmer's markets and gourmet stores, but it's so much nicer and varied when someone else does it for you on this scale. Start at the raw bar for a selection of oysters, mussels, shrimp and crab claws. In place of the typical cocktail sauce are such condiments as champagne mignonette, avocado tartar (translation: guacamole), lomi tomato relish, wasabi, herb remoulade, mango cocktail and bottled hot sauces. As wonderful as that is, don't go overboard, because across the way is smoked salmon and an artisan cheese board also featuring fresh grapes, plus dried cranberries, pears and apricots, and walnuts. A 'Nalo Greens station features micro greens, corn sprouts and an array of condiments, sitting next to the flatbreads and crostini accompanied by rich spreads of humus, a nutty pesto, roasted eggplant and olive tapenade. Another stop at the antipasti station for roasted garlic, eggplant caponata, salami, ham and spoonfuls of mozzarella and tomatoes should fill you up. But there is also a continental station where you can pick up slices of spice cake, croissants, granola and yogurt parfaits, and other pastries. You'll need a strategy for filling your plate for maximum pleasure without getting overstuffed. 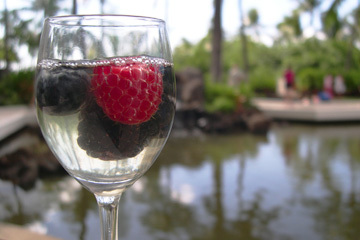 A dessert of raspberries, blueberries and blackberries in white wine gelatin is enjoyed in the open air at Azul. ON YOUR WAY back to the table, you'll be sidetracked by the small-plate station. Those who've worked in restaurants will be able to scoop up all three dishes with ease. For others, a return stroll at this point will probably do your opu some good. 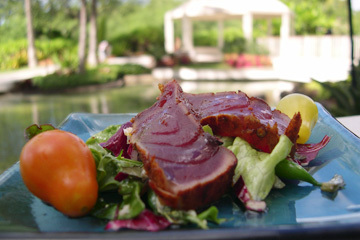 Waiting for you here will be seared ahi atop a small salad of 'Nalo Greens and accompanied by red and yellow teardrop tomatoes, delicate beef carpaccio and a small portion of rock shrimp ceviche that outdoes every Mexican restaurant in town. By this time a server would have taken your entree order. Lobster Benedict was a welcome surprise. The lobster was perfect, neither dry nor overcooked nor shrimpy in size. It was the generous equivalent of a whole sweet Maine lobster tail split between two English muffins with the requisite egg all coated in lemon thyme Hollandaise. A thick slice of prime rib arrived with accompaniments of horseradish, rosemary Dijon and onion marmalade, which I ordered just because prime rib is so popular. I'm more into varied flavors and textures so probably would have been better off ordering the porcini-dusted lamb chops with baby arugula feta salad and pomegranate demi jus, or the vegetarian risotto with Kahuku corn, sweet pea shoots, roasted tomatoes, grilled alii mushrooms and yellow tomato coulis. Oh well, as the waiter who suggested the prime rib said, "You live here, so you can always come back." Desserts of tiramisu, strawberry and midori panne cotta, crème brûlée and more, will leave you with sweet thoughts. 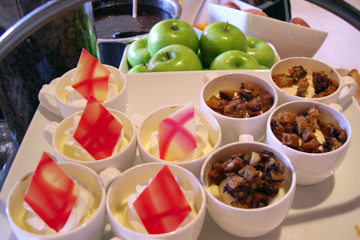 Also offered is a chocolate fondue station with buckets of white, milk and dark chocolate and fruit for dipping. The combo of dark chocolate and bananas is to die for. Some people were so enamored by this station that they ate parts of the chocolate sculpture display. Hands off this week, OK? » The phone number for JW Marriott Ihilani Resort and Spa is 679-0079. An incorrect number appeared on in the Weekly Eater column on Page E5 Sunday. Tiramisu is served with different toppings. Ahi nicoise is one of three small plates offered during Sunday brunch.